Acknowledge the star performers on your team with this sleek, modern resin design. The gold and black perpetual stars serve as a back drop for a full color soccer ball. Attached to a black base that has plenty of room too add a personalized plate, the Infinity Star is an award that fits any budget. A silver and gold star backs this adorable, comical character with a soccer ball head and a winning smile. 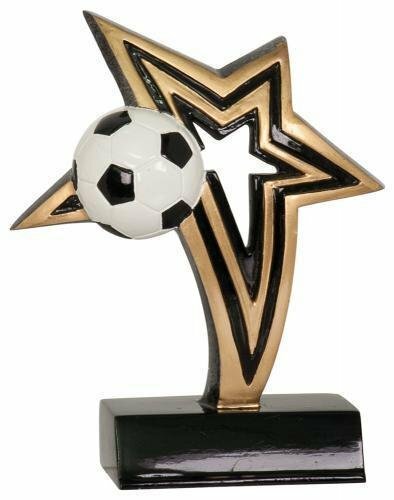 Add a plate personalized for your event to the 5" Little Pals Soccer Resin, and this modern, budget friendly award is perfect, especially for the younger athletes, but great for any age. These Soccer Live Action awards have many unique features that set it apart. Available in both male and female versions the soccer players are shown in a bicycle kick motion with their leg full extended as if they just hit the ball and are set against a gold and black tone action ribbon giving these awards a dynamic look. A detailed white and black paneled soccer ball completes the look. These award stand 8" and have plenty of engraving area on the base to accommodate your personalization needs. The gold and pewter finish highlights this award, making these the perfect soccer awards. This Male Soccer award is a memorable keepsake that will be cherished by the recipient for years to come. A soccer player is depicted with their leg outstretched getting ready to kick the winning goal while the unique bronze color finish makes this award something special. This Legend of Fame award measures 8 X 6 and also comes in a smaller size, 6 1/2 X 5. A large area at the bottom of the award can accommodate all of your personalization needs. This item can either be hung on a wall or placed on a desk using the included stand. Dynamic lines are the hallmark of this Soccer Male Star Award. The unique star design of the male soccer figure is shown in full sprint getting ready to kick the ball to back of the net to score the winning goal. The regal black base forms a rounded shape to complete this award. This award stands 8 1/4" tall and has plenty of room for whatever your personalization needs might be. After you have added this item to your cart, you can modify any of the parts for any sporting or academic activity.